Lancer Captain Shar’naan is wanted for dealing in black market goods. GDF intelligence has tracked the Lancer Captain and his crew to a small outpost on Safaris VII. The Lancer Captain is indeed here to acquire black market goods, rumor has it a small consignment of Fahz Jiin to smuggle in the hopes of turning a profit. 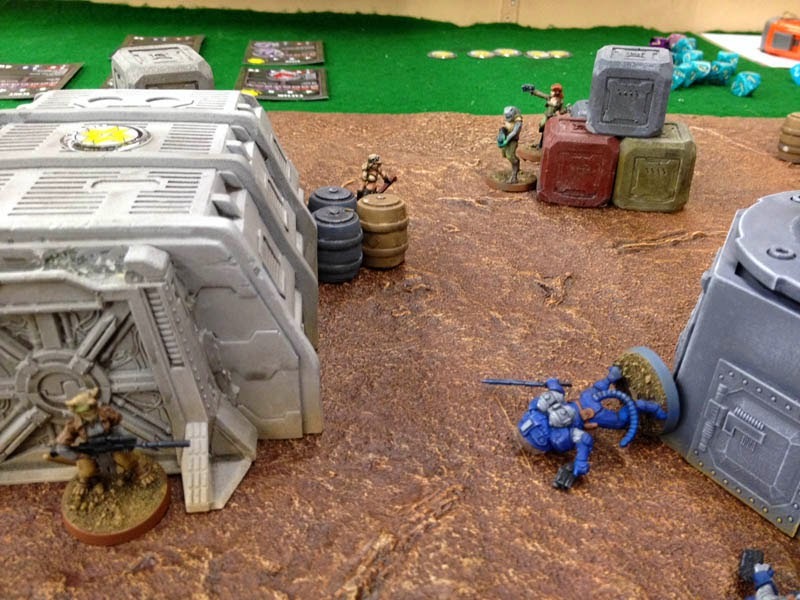 He and his crew arrive to find GDF forces patrolling the outpost and in the way of their objective. The Lancers swiftness gains them the initiative. The Scout and Captain rush forward toward their objective, a small Inhabitabubble, keeping to cover. The Fixer attempts to move forward toward the hut as well, but is fired upon by the GDF Sharpshooter perched atop some crates on Overwatch. 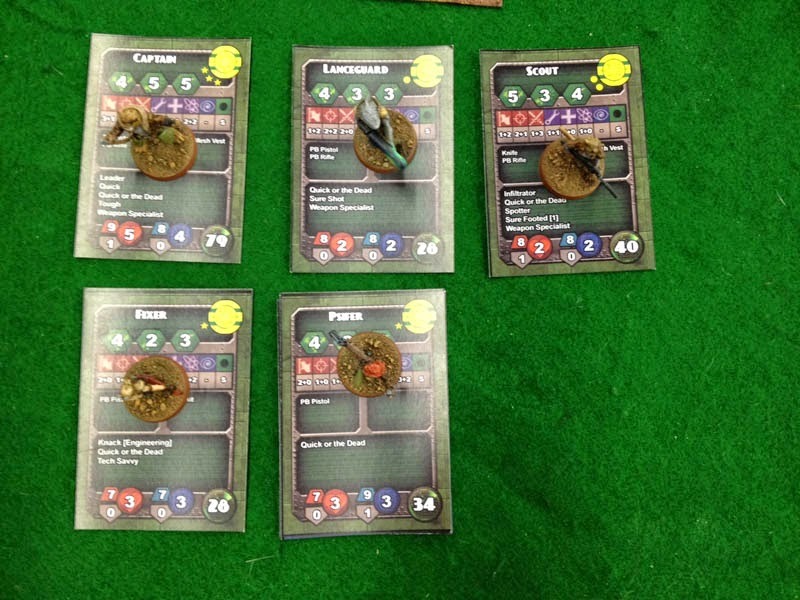 The Sharpshooter misses and the Fixer ducks among another stack of crates, returning fire, but also misses. The Lanceguard now aware of the danger, takes aim on the Sharpshooter and fires, scoring two hits which prove fatal. 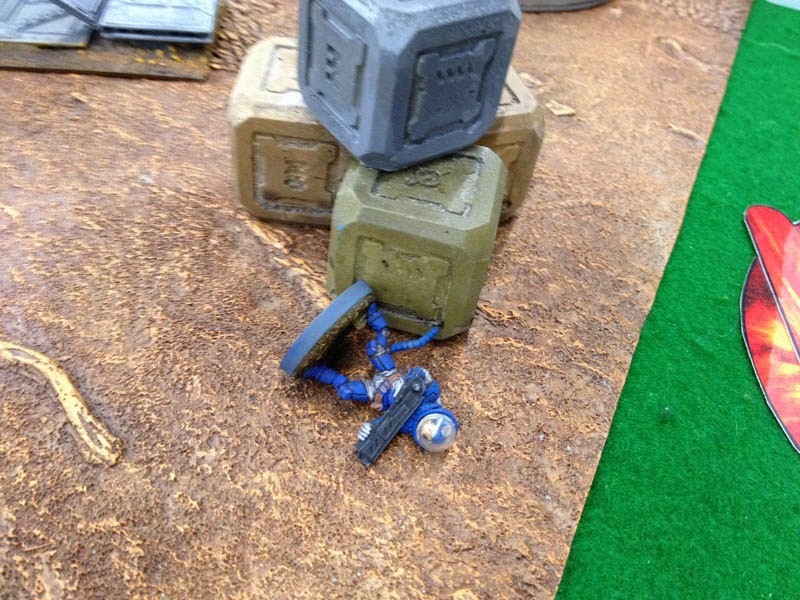 The GDF Sharpshooter falls, the first casualty of the conflict. 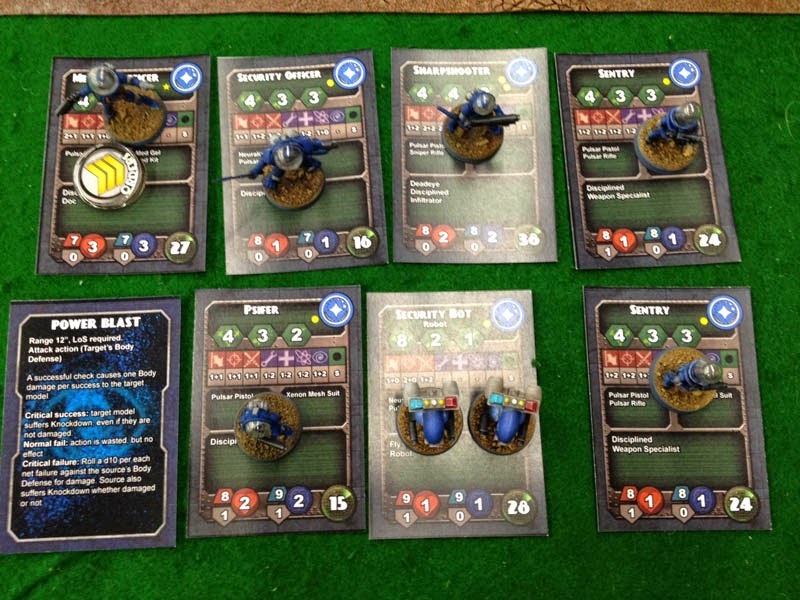 The Lancer Psifer remains behind cover, but draws upon the Deep to protect the Fixer and the Lanceguard with Force Field. Her attempts are unsuccessful. The main force of GDF surges forward. Twin security bots fire, but miss their Captain and Lanceguard targets. The stalwart GDF do not Panic, remaining intent in the arrest of the Captain and his crew. The GDF manage to wrest the initiative from the Lancers. 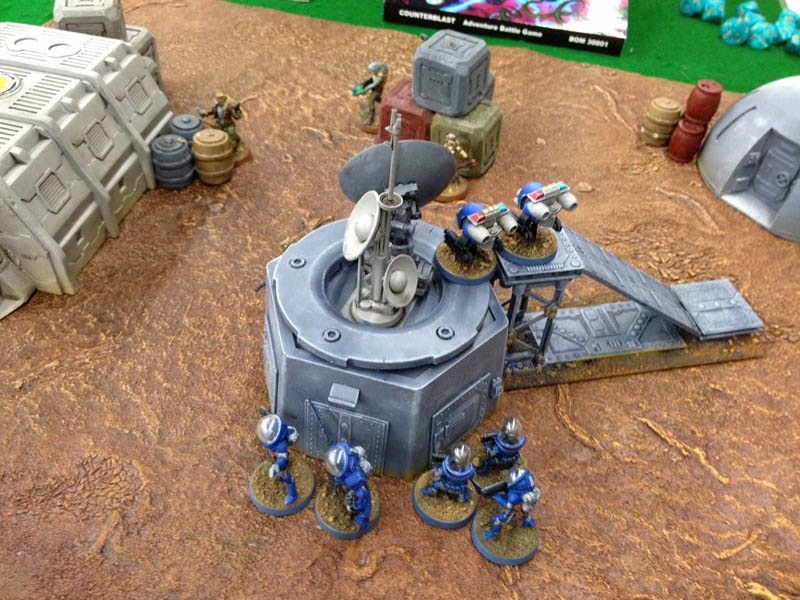 The Medical Officer sets the Security Bots on Overwatch from an advantageous position by a reception tower. Before her cremates move out, the Lancer Psifer once again attempts to protect them and manages to gain shielding for the Lanceguard. The Fixer fires at the Security Bots, but misses. The Lanceguard also tries to remove the Security Bot threat and he, too, misses. 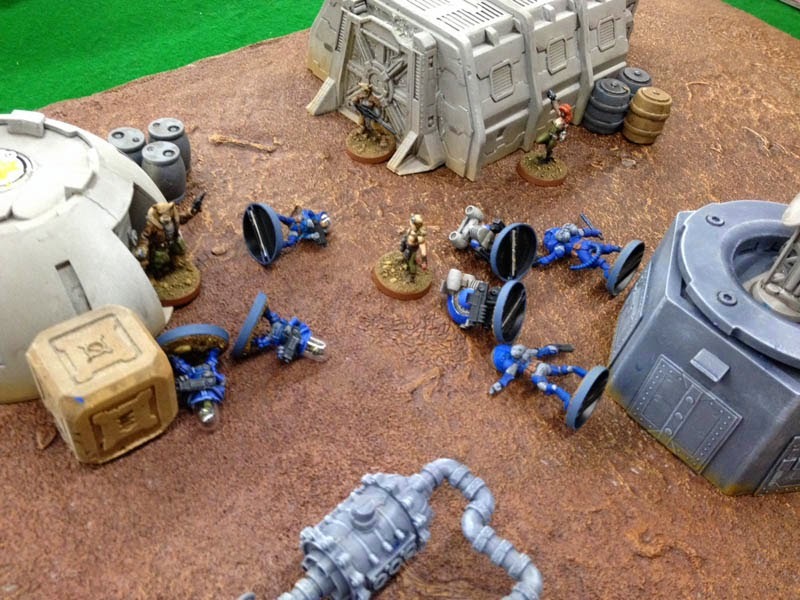 The Captain wants to move forward to make his rendezvous and attempts to shoot the GDF leader, but he is interrupted by shots from the Security bots, who open fire. One shot strikes close, but the Captain ducks behind some barrels which deflect the shot. The Captain aims and scores 3 hits on his target, the GDF leader. 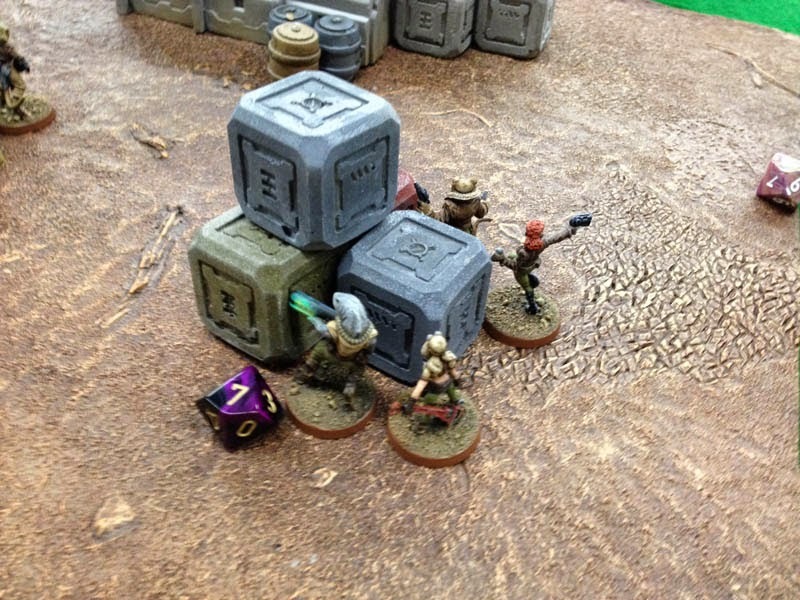 Shielding deflects 1 of the deadly bolts, but 2 get through and the Medical Officer goes down. The GDF Security Officer engages the Lancer scout in melee, but neither is able to gain the upper hand. The GDF Psifer calls upon the Deep and Power Blasts the Lancer Captain, causing a wound. 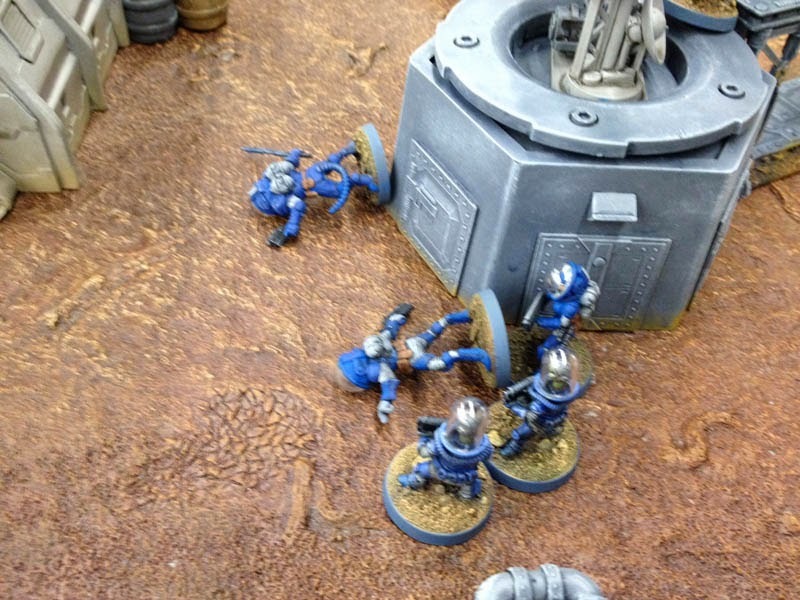 Both GDF Sentries shoot at the Captain, but their hits are deflected. The Lancers gain initiative. The Lancer Scout manages to successfully disengage, retreats a short distance away from the Security Officer and fires at him, but misses. Meanwhile the Lancer Captain makes a run for it and reaches the doorway of his destination. The Fixer moves forward taking a shot at the Security Officer, but misses. Fortunately for her and the Lanceguard, the Lancer Psifer is able to put shielding on both of them. The Lanceguard scores three hits on the Security Officer. Two get through, taking the Security Officer down. 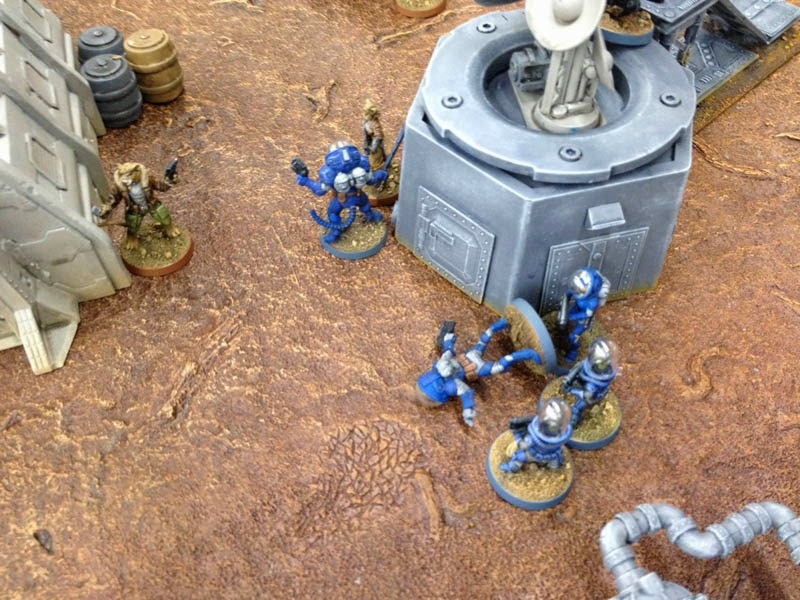 Both GDF Sentries and the GDF Psifer charge the Lancer Captain, determined to make their arrest. The Captain gets a few shots off before they reach him, managing to cause a wound to the GDF Psifer. A furious melee ensures with no one gaining the upper hand. Both Security bots move to shoot at the Lancer Scout, but miss. The Lancers gain the initiative yet again. Their Scout aims takes down the GDF psifer. 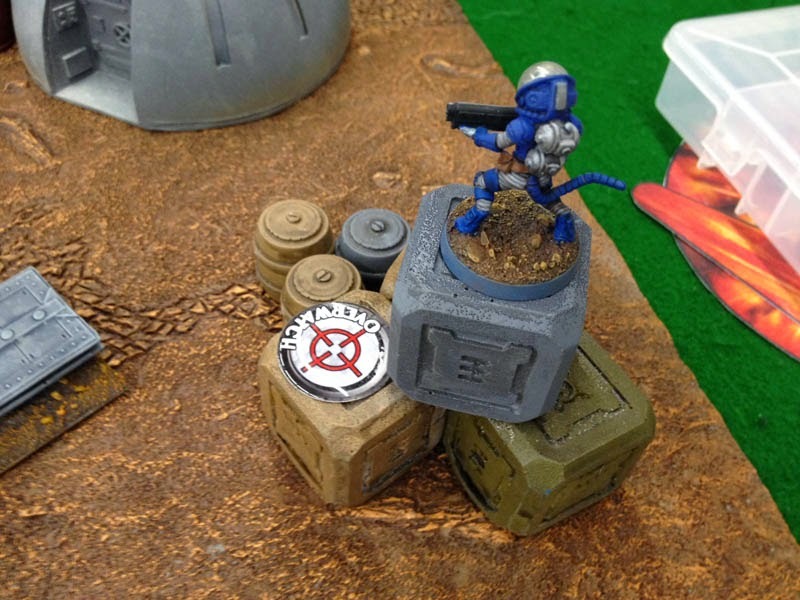 The Captain remains in melees with the two GDF sentries. 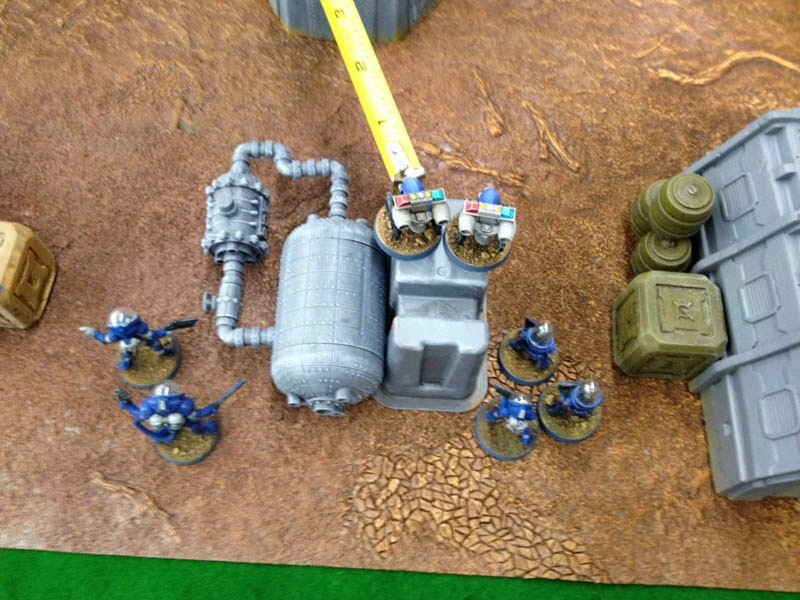 The Security bots attempt to pin down the Lancer Scout, but cover negates both hits. The Lanceguard attempts to take out a Security bot, but misses. Both GDF Sentries press the Captain in melee, but gain no advantage. The Lancer Psifer attempts to call upon the Deep to Power Blast a Security bot, but is unsuccessful. The Fixer aims and fires at a GDF Sentry, but misses. Once again the Lancers quickness serves them well. The Lancer Scout aims and fires, taking down one sentry. The Captain remains locked in melee with the remaining GDF Sentry. The Lancegaurd manages to score a damaging hit, finally taking down one of the Security Bots. The remaining Security bot fires at the Scout, but misses. The Lancer Psifer attempts to Power Blast the Security bot, but is unsuccessful. As the Security Bot remains a threat, the Lancer Psifer manages to shield the Lancer Scout with Force Field. The Fixer tries to do her part, firing at the Security bot, but the bolt is deflected by its tough armor. The Lancer Scout shoots the Security bot, but the hit is deflected. The Captain remains in melee with the GDF Sentry who manages to cause a second wound to the Captain. Taking careful aim, the Lanceguard finally manages to take down the remaining Security bot. 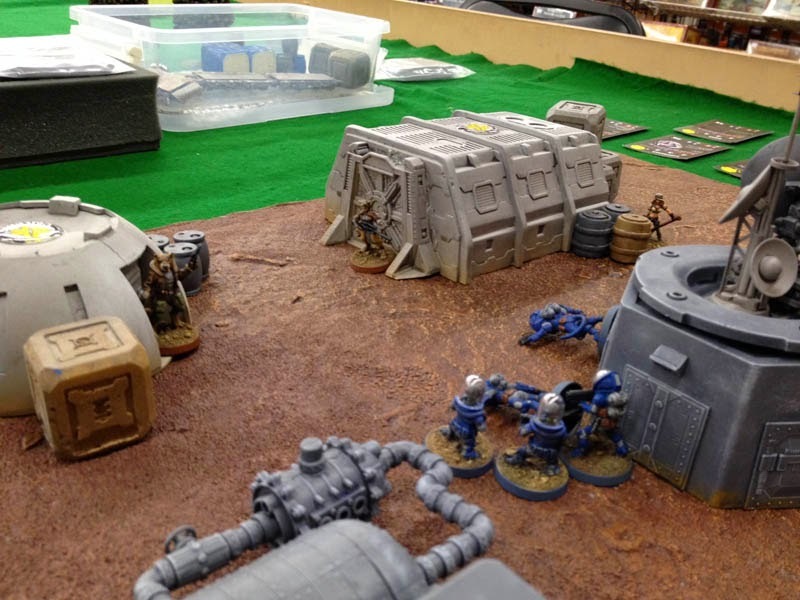 The Fixer races toward her Captain to aid him while the Lancer Psifer moves within range of the GDF Sentry and strikes him with Power Blast, taking him down. This cleared the field for the Lancer Captain to acquire his stash and the crew made off with the goods.